We have featured a number of articles and videos in recent years in which Dr. Bernard Arocha discusses the different classifications of hair loss among women, including, “Female Pattern Hair Loss: Artistic Hair Restoration Works for Women,” but not all women are the same. For instance, there are a number of causes of hair loss among African-American women that are fairly unique. 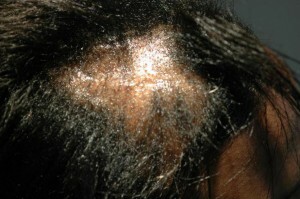 One cause is traction alopecia, hair loss that occurs as a result of continuous pulling of the hair. Pulling may occur from hairstyles such as tight cornrows, plaits or braids with or without extensions, weaves, ponytails or even hair rollers or curlers. Natural hairstyles can also lead to traction alopecia as well. 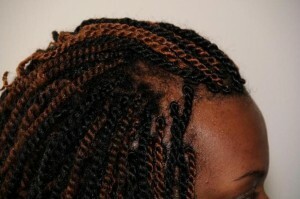 Long heavy locks and tightly coiled twists can lead to traction alopecia. The hair loss associated with traction alopecia typically occurs at the frontal hairline, at the temples or the area of the scalp above the ears. It may also occur at the posterior hairline. If you notice your hair is breaking off or coming out, it is very important that you consult a dermatologist immediately to find out what is causing your hair loss. If you continue wearing the tight hairstyle the hair loss may be permanent. Wikipedia offers additional information about traction alopecia here. Central Centrifugal Cicatricial Alopecia (CCCA) is hair loss (alopecia) that begins in the central (vertex) portion of the scalp. CCCA is most commonly seen in black women and it can occur at any age. This type of hair loss causes scarring (cicatrix) of the hair follicles. Once a follicle is scarred it is destroyed and hair will never grow from that follicle again. When you look at the scalp, it may appear shiny and often you will not see follicular pores or hair follicles. For more on CCCA, Wikipedia’s overview here offers solid information. Women who attempt to camouflage the area run the risk of causing even more damage and further hair loss. Camouflaging with sewn-in or glued-in weaves or tight braids may allow women to forget or ignore the alopecia, but it does not solve the problem. Proper evaluation with a hair loss with a hair loss expert is very important. A physical examination, dermoscopy, a lab evaluation and a scalp biopsy may be needed. If CCCA goes untreated, the hair loss can become extensive which can be devastating for many women.